Phalaenopsis, the moth orchid, is one of the best orchids for growing in the home, and is also a favorite with greenhouse growers. Well-grown plants will flower for up to 6 months! Culture for Doritis, a related genus, and Doritaenopsis, a hybrid between the two genera, is the same as for pure Phalaenopsis. LIGHT is easy to provide for phalaenopsis. They grow easily in a bright window, with little or no direct sun. An east window is ideal in the home; shaded-south or west windows are acceptable. Artificial lighting is excellent. Usually four fluorescent tubes in one fixture are placed 6" to 1' over the leaves, 12 to 16 hours a day, following natural daylength. In a greenhouse heavy shade must be given; 70% to 85 shade, or between 1,000 to 1,500 foot- candles, is optimum. No shadow should be seen if you hold your hand one foot above the plant's leaves. TEMPERATURES for phalaenopsis should usually be above 60 degrees F at night, and range between 70 and 85 degrees F or more during the day. Although higher temperatures force faster vegetative growth, higher humidity and air movement must accompany higher temperatures, the recommended maximum being 90 to 95 degrees F. Night temperatures to 55 degrees F are desirable for several weeks in the fall, in order to initiate flower spikes. Fluctuating temperatures can cause bud drop on plants with buds ready to open. WATER is especially critical for phalaenopsis. Because they have no major water-storage organs other than their leaves, they must never completely dry out. Plants should be thoroughly watered and not watered again until nearly dry through the pot. In the heat of summer in a dry climate, this may be every few days, and in the winter in a cool northern climate, it may be every ten days. Also, the type of potting media will determine the frequency of waterings. Plants potted in sphagnum moss generally take longer to dry out and so can be watered less often than plants potted in bark. Water only in the morning, so that the leaves are dry by nightfall, to prevent rot from occurring on the leaves. 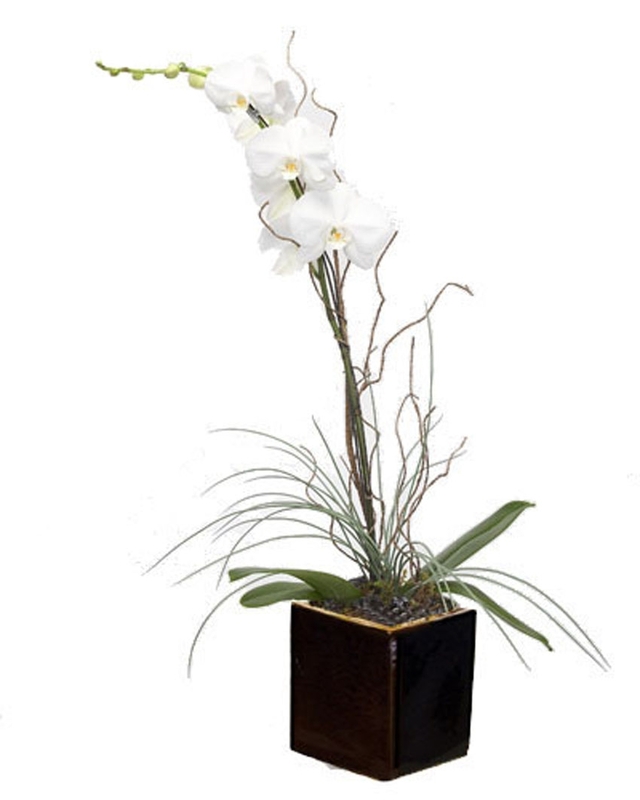 HUMIDlTY is important to phalaenopsis, the recommended humidity being between 50% and 80%. In the home, set the plants on trays of gravel, partially filled with water so that the pots never sit in water or have a humidifier in the room. Mist the plants in dry climates, or during dry weather, in the mornings only. Grouping plants together raises the humidity by conserving the water that plants transpire. In humid climates, as in greenhouses, it is imperative that the humid air is moving to prevent fungal or bacterial diseases. Again, leaves should always be dry by nightfall. FERTILIZER should be applied on a regular schedule, especially if the weather is warm, when the plants are most often growing. Once-a-month applications of high-nitrogen fertilizer (30-10- l0, or a similar formulation) are appropriate in warm, humid conditions for plants potted in bark. Those potted in moss prefer a 20-20-20 formula. When flowering is desired a high-phosphorus fertilizer (10-52-10, or a similar formulation) may be applied. For monthly applications, we suggest that fertilizer be applied at ½ recommended strength. Some growers apply fertilizer at 1/4 strength with every watering; this is best for warm, humid conditions. POTTING is best done in the spring, after blooming. Phalaenopsis plants must be potted a well-draining mix, such as fir bark, various types of stone, sphagnum moss, or combinations of these. Potting is usually done every 1 to 3 years. Mature plants can grow in the same pot until the potting medium starts to decompose, usually in two years. Root rot occurs if plants are let in a soggy medium. Seedlings usually grow fast enough to need repotting yearly, and should be repotted in a fine-grade potting medium. Mature plants are potted in medium-grade potting medium. When mature, a plant may stay in the same pot size for many years, but must have the medium changed. To repot, remove the entire old medium from the roots, trim soft, rotted roots, and spread the remaining roots over a handful of medium in the bottom of a new pot. Fill the rest of the pot with medium, working it through the roots, so that the junction of the roots and the stem is at the top of the medium. Keep the plant shaded and humid, but drier in the pot, for several weeks to promote new root growth. A vitamin Bl solution sold in nurseries may be helpful in establishing plants.